EFCC has arrested two young men who claimed to be undergraduates of the university of Jos, Isaiah Friday and Azzaior Samuel, for an alleged N2.05bn fraud. Salihu Mahmoud and Dan Ibrahim, were also arrested in connection with the allege crime. 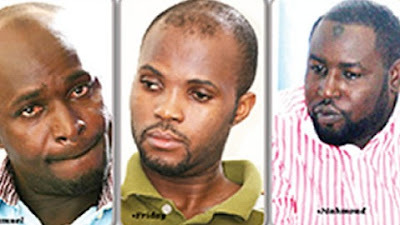 The head, media and publicity, EFCC, Wilson Uwujaren, said the suspects were arrested in Lagos and Jos. He said, “Their arrest comes on the heels of a petition which the commission received from Union Bank of Nigeria Plc, Marina, Lagos, in January 2013, alleging that a criminal attack had been launched on its data base known as ‘Flexcube’, by yet-to-be-identified criminals who falsified the bank records and accounts and created unjustified huge opening balances in several accounts across the bank’s branches. They subsequently transferred funds from those accounts to several accounts in other banks. It was learnt that EFCC initial investigation showed that Friday, who was carrying out computer system maintenance services for one of the Union Bank branches in Jos, Plateau State, on a part-time basis, paved the way for the fraudsters to penetrate the bank’s database. Uwujaren said, “Friday was traced and arrested. His arrest led to the arrest of Azaaior Samuel. “Investigations further revealed that Samuel introduced Friday to Mahmoud, who is the mastermind of the fraud with others now at large. It was learnt that after the gang had succeeded in gaining access to the bank’s premises, it carried out the postings to six different company accounts domiciled in Union Bank’s Marina branch in Lagos. The EFCC spokesman added that the commission had been able to recover $2,129,900 and another N134,542, from the fraudsters. He said, “Other items recovered are furniture worth N10m from Salihu Liman’s one bedroom apartment in Yaba, Lagos; four vehicles, landed properties in Kano and Kaduna and a four-bedroom duplex worth N45m in Lagos.